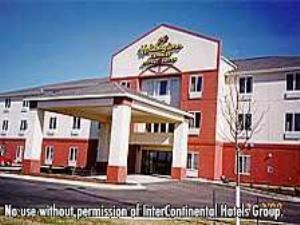 The Holiday Inn Express Hotel Pekin is located off of Route 9 just 7 miles West of 155. Our Hotel features 70 guest rooms with many amenities, including an indoor swimming pool, jacuzzi, fitness center, business center, meeting rooms, wireless internet access and extended continental breakfast. We offer King Suites with microwaves and refrigerators and Whirlpool Suites. We are also located just blocks from the new Dragons Dome. EastPort Banquet & Meeting Center of East Peoria is designed to be the perfect location for your wedding, social or corporate event! Positioned on the IL River, Eastport is highlighted by a beautiful view of the Peoria skyline. Adorned with a charming mixture of traditional and contemporary amenities and a natural nautical landscape, this facility is perfect for your next special occasion or wedding reception. Host a large gathering in the main room; an intimate event in our private room; or a family picnic on the outdoor deck overlooking the Illinois River. Whether it’s your wedding ceremony, wedding reception, a company meeting, or your high school reunion, EastPort Banquet & Meeting Center’s professional and courteous staff will attend to your every need. Our spacious Hall is available to host your special event. Allow our venue to showcase your Wedding Reception, dinner event, business or company function, as well as informal get-togethers. The banquet room can seat 350 comfortably and has ample dance floor space, perfect for Wedding receptions with an adjacent full service bar. Kitchen facilities are also available for use at an additional cost for your catering needs. The site is nicely landscaped and has a well lit handicapped accessible parking lot. The Spirit of Peoria is available for private parties to rent, either for an actual private cruise, or just for the use of its beautiful facilities. Perfect for weddings, corporate events, birthday parties, and more! Kids and adults alike will be fascinated by the boat’s tall fluted stacks and gigantic candy-apple red paddlewheel churning through the water. It’s great entertainment for all ages. Trip includes Captain’s Commentary. Gift shop and concessions are available.